In this extract from her warm and funny memoir The Bridge Ladies, Betsy explains how discovering the unsung lives of her mother's oldest friends helped her to develop a better understanding of, and a more meaningful relationship with, her mother. Betsy Lerner's relationship with her mum had always been a battleground, until her husband got a new job that took them back to where she grew-up, only five miles from her mother's house. In this extract from her warm, funny memoir The Bridge Ladies, Betsy explains how discovering the unsung lives of her mother's oldest friends helped her to better understand, and develop a more meaningful relationship with, her mother. As a child, I was fascinated with the Bridge Ladies. They showed up regularly at our house, their hair frosted, their nylons shimmery, carrying patent leather pocketbooks with clasps as round as marbles. I loved greeting them at the door, hanging up their coats in our front hall closet, where I often played inside the folds of my mother’s mink. I watched as they gathered around the card table, crowded with a twinset of cards, ashtrays, cellophane-wrapped cigarette packs, a scoring pad, and crystal dishes of candy. Eye level to the Bridge table, I greedily surveyed the candy and would plan high-speed kamikaze raids to nab some from below my mother’s radar. Where my father would let me sit on his lap while he played Gin Rummy for a hand or two, the Bridge Ladies erected a square fortress with their backs as they played, communing in their strange language of bids and tricks. As a teenager, I’d make myself scarce when the Bridge Ladies came over. As far as I was concerned, they were square. They didn’t work, didn’t seem to get that feminism was taking over the world. Billie Jean King had defeated Bobby Riggs in the Battle of the Sexes Tennis Match, Gloria Steinem had started Ms. magazine, and Helen Reddy roared. 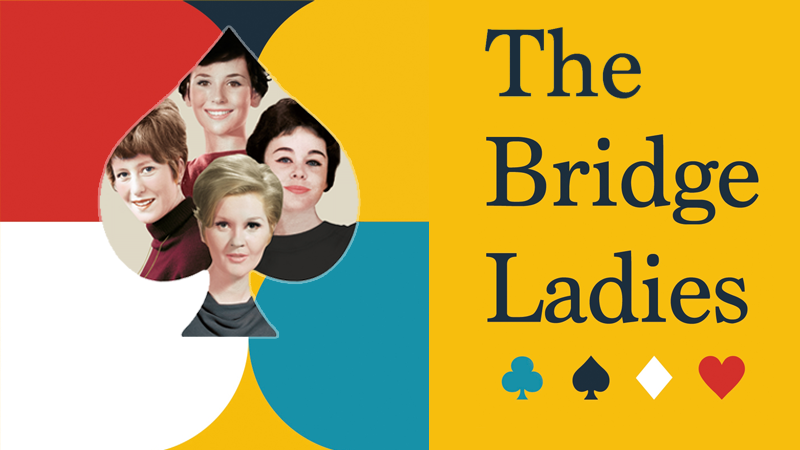 To me, the Bridge Ladies were conventional, their sphere limited to family, synagogue, and community. Their identities restricted to daughter, mother, and wife. On top of which their idea of fun was an afternoon of playing Bridge. Seriously? I was after bigger game. I was already reading Anaïs Nin and Henry Miller. In other words, I was determined to lose my virginity as soon as possible and have many lovers. I hated our New Haven suburb and my high school for its devotion to conformity. As far as I could tell, the most creative endeavor for the girls was growing their hair as long as possible in order to qualify for the national “Long & Silky” contest. All I wanted to do was get out and stay out. I spent my time dreaming of escape to New York, speciﬁcally Greenwich Village, where I hoped to ﬁnd like-minded people, poets, and writers. I moved there for college and stayed for graduate school. Though I didn’t become a ﬁxture at Studio 54 or Warhol’s Factory, I’d made a life there: worked in publishing, eventually married, and had a daughter. Then something happened. After twenty years of living and working in New York, my husband was offered a job at Yale University Press. You didn’t need a Google map to see where this was going: New Haven, my childhood home and the crucible of my pain. I was supportive when he accepted the job; the reality of moving home took a little longer to fathom. For me, the biggest challenge was having my mother become a regular part of our lives. When I lived in New York, we spoke once a week, perfunctorily on Sundays. Now I would be living 5.1 miles away from her. I told myself I could handle it. After all, I was well into my forties when we moved home, I was a mother in my own right, yet my conﬂicts with my mother still ﬂared brightly. Why was everything so loaded? Why was I reduced to my teenage self almost every time we got together? Was everything she said a criticism, or did it only sound that way? We circled each other like wary boxers. Once, she asked why I bought low-fat cottage cheese instead of fat-free and nearly set off a world war between us. It was cottage cheese, for god’s sake! Translated through the mother-daughter lexicon: Was I ever going to be good enough? When my mother was recovering from some surgery in January of 2013, I stayed with her to help out. We had been living in New Haven for more than a decade by then, my dad gone, my daughter a teenager in her own right, we had made new friends and were knitted in. I had become a partner in a literary agency and was commuting to New York twice a week, getting my city ﬁx. On top of that, God shined down his light on our fair city and conferred an Apple Store upon us. Did I really have any reason to complain? I wasn’t exactly looking forward to staying with my mother, but I also knew the job would be made less onerous by the fact that she, even at eighty-three, was more comfortable refusing help than demanding it, best summed up in the well-known joke: How many Jewish grandmothers does it take to screw in a lightbulb? You shouldn’t worry . . . I’ll sit in the dark. Every day, one of her Bridge Ladies visited, as if in an unspoken rotation. They were smaller now, some a little unsteady, but still decked out in color-coordinated outﬁts, accessories, heels, and bags. When they said I looked good, I wondered if they really thought I was fat, if my unruly hair was an offense. When they asked after my husband and daughter, it struck me that they had been there for all of the rites of passage in my life: they had attended my bat mitzvah, danced at my wedding, and sent gifts when my daughter was born. I had never really taken stock of their generosity; they likely had no idea how much adolescent rancor and disrespect I harbored. Or how I had clumped them all together like the presidents carved into Mount Rushmore, indistinguishable one from another. As demographics go, the Bridge Ladies couldn’t be more alike. They are all in their eighties, all Jewish, and they all attended college. They married young, married Jewish men, and stayed married to them. They had 2.5 children. None worked outside the home during the years they raised their children, except Rhoda, who shattered the stained-glass ceiling when she became the executive director at the synagogue. They did the shopping and cooked the meals; The Joy of Cooking, published in 1936, was their bible. They picked up the dry cleaning and cleaned their homes. (Eventually, each would be able to afford cleaning ladies, as they would all become upwardly mobile.) They decorated and planned vacations, from the Catskills to Puerto Rico to Rome. They lived through the Depression and World War II. Some of their husbands joined the war effort. They witnessed the civil rights era, The Vietnam War, and the feminist movement, though they didn’t shed their girdles or burn their bras. They were just a little too old or insulated to embrace The Feminine Mystique or articulate the problem that had no name. They saw interfaith marriage among their children and inter-racial marriage among their grandchildren. When they grew up, gay people were completely closeted, like movie star heroes Montgomery Clift and Rock Hudson. Today, they are witness to the legalization of gay marriage in every state in the nation. Though they were not all born in New Haven, they have lived in the greater New Haven area for all of their adult lives, they raised their children here, four have buried husbands here, and one buried a daughter. They are all in relatively good health (knock on wood, poo poo poo). Their adult children are as great a source of pride as they are of aggravation. They don’t like to brag, but their grandchildren are brilliant. And on Mondays at noontime, for the past ﬁfty-ﬁve years, they gather for lunch and Bridge, the card game whose golden age coincided with their generation’s coming of age. Bridge was the HBO of its day. In the 1930s and 1940s, 44 percent of American households had at least one Bridge player. Matches were broadcast on radios, and popular movies like Sunset Boulevard and Shadow of the Thin Man featured scenes with Bridge games. Robert Cohn, a character in Hemingway’s The Sun Also Rises, boasted about his winning streak at Bridge. The New Yorker published “My Lady Love, My Dove,” a Roald Dahl story where a couple are caught swindling their hosts during an evening of Bridge. Charles Goren was a household name, the man who popularized the system of counting points still used today. His books have sold millions worldwide, clogged the bestseller lists, and his Bridge column appeared in nearly two hundred newspapers. The guy was a rock star. Enter television. By 1954, more than 80 percent of American households had TV. Evenings once spent listening to the radio and engaging in social activities like Bridge got crushed. Today, there are approximately three million active Bridge players, which puts the game on par with stamp collecting and ﬂy-ﬁshing. In 2015, after an eighty-year run, the New York Times cut its Bridge column. How long can the game exist? Not one of the Bridge daughters learned to play, not at our mothers’ sides and not in college, where most of them learned in the parlor rooms of their all-girl dormitories. When each one of the ladies braved that nasty winter to pay my mother a visit, I found myself inexplicably happy to see them, almost giddy as I took their coats, as I had as a child, hanging them up in our front hall closet. It was no longer stuffed like a dry cleaner’s carousel with coats and slacks suffocated in plastic wrap. My mother’s mink long retired, the closet now had a sad capacity. The wooden hangers clattered against each other like wind chimes before a storm. I held back an intense longing for my father, growing concern for my mother, and shame for how I used to feel about this small band of women. Each one brought a meal or brownies or cookies. 'I need those like a hole in the head,' my mother would announce when they left, though we’d gobble them up after dinner while watching back-to-back reruns of The Big Bang Theory. After my mother recovered, I couldn’t stop thinking about her friends from the Bridge club and what seemed to me the vast distance between our generations. Even their names connoted a bygone era: Bette, Bea, Jackie, Rhoda, and my mother, Roz. (Though Bridge is a game for four, there are ﬁve women in the club. In case one can’t play, they still have a game; this way the show goes on.) I had known these women my whole life and hardly knew them at all. I was deeply touched by their support and loyalty to my mother. According to her, the Bridge Ladies have grown apart over the years, their affection for each other is sometimes blunted, their lives diminished by the effects of aging. Despite differences and silences built up over the years, there exists a devotion to one another; these are dutiful women, their love ﬂinty, but made to last. I knew that if I were to get sick, there wouldn’t be such a steady stream of friends visiting. I’d be lucky to get a few texts with smiley face emojis and some messages on my wall. Facebook may connect us across the world and throughout eternity, but it won’t deliver a pot roast. I wondered what their lives would have been like had they been given our opportunities. Did they dream of having other partners? Were their marriages based on love, their husbands’ potential as providers, or a combination of the two? Whenever I asked my mother if she loved my father, her answer was always the same: he is a good father and a good provider. I got the feeling her ability to choose was as important as his ability to earn. And, of course, it was. For my mother and for all of the ladies, their fate largely rested on one choice: the man they married. Their ﬁnancial well-being depended on it. Without a doubt, the men set the stages on which they lived their lives. 'I did, I truly did.' She means it. Or she thinks she means it. I remember many days growing up when deferring didn’t look all that great. I wanted Hepburn and Tracy, Bogey and Bacall; I wanted big love for them, not something prudent, economical. But the ladies come from a different stock. In the ﬁrst place, they accept their lot. They are grateful for it! The concept of loving yourself ﬁrst is unheard of to them. Who had time, with a husband and family to take care of ? They didn’t dwell on their inner lives. They didn’t stretch their spines on yoga mats, and they certainly didn’t spend hours in therapy sessions complaining about their parents. Oh, the billable hours my friends and I have logged both condemning our parents and seeking their love. If anything, the ladies don’t understand our self-obsession, our selﬁshness. When I asked the ladies if I could sit in on the game, they invited me to join them for lunch and Bridge on Mondays, and eventually into their homes for one-on-one conversations about their lives. At the outset, I was interested in the mundane moments: carpooling, packing lunch boxes, or mixing up a batch of sour cream dip with Lipton’s Onion Soup Mix. I wanted to know about Dr. Spock and Dr. Seuss, and what it was really like raising a generation of children more entitled and indulged than any other that had come before, my generation: the baby boomers. I was also curious how they felt about all they missed out on: the Pill, pot, and Jimi Hendrix. What was it like ﬁnding a joint in a teenager’s jeans, or birth control pills in her purse? In the end, I wanted to know how the ladies felt about everything that mattered to me and to my generation.I wanted to see where we connected, if we connected. I thought I’d go to the Bridge club for a few weeks but stayed for nearly three years. When they opened up to me, I found their stories moving and poignant. I once deemed the ladies not worth knowing; now I wanted to know all I could. This was especially true with my mother. I had no idea that by entering her world, I would begin to bridge both the generational gap and personal gulf that had deﬁned our relationship. A year or so in, I started taking Bridge lessons, a game that well acquaints you with your deﬁcits. With little natural afﬁnity for the game, I persisted, often at the encouragement of the ladies. My older sister, stupeﬁed by my project, once asked, her voice thick with disbelief: Do you actually like Bridge? Do you like them? In part, this is a group portrait of the ladies, what they share with each other, but also what they keep to themselves. Like my mother, these women don’t openly reveal their feelings. Pain is a private matter. Sometimes, watching the ladies play Bridge, I can see the girls they once were and the cards they were dealt; it’s all there in their faces as they open a new hand of cards, each ripe with possibility, rife with disappointment. In discovering the unsung lives of the Bridge Ladies, I also came to better understand the ragged path that connects me to my mother. This is our story, too.